Looking for Shomrei Kashrut and non-smokers, (please confirm you are SK/SS, NS in your reply). 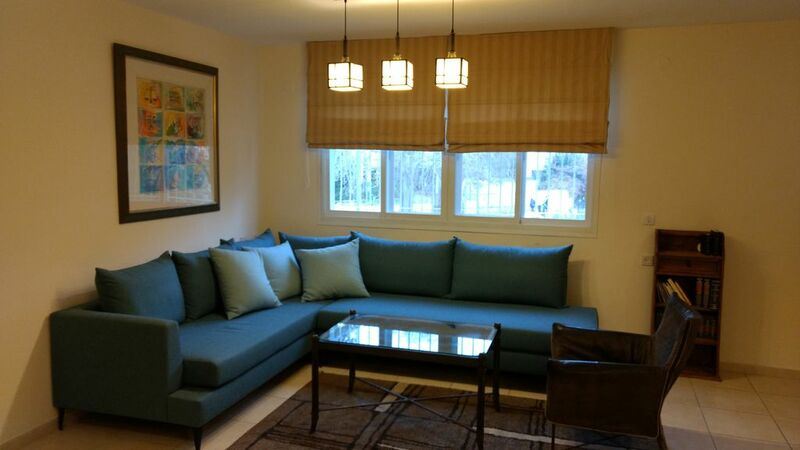 Enjoy your Jerusalem Holiday/ Vacation in this spacious 3 Bedroom-1.5 Bath Apartment. Just 2 blocks away from famous Emek Refaim Street, filled with chic cafe's, upscale eateries, artisan boutiques, food markets, Day-Spa, gym, pool, cinema, cultural centers, bookstores, and many shops. It has a fully equipped state of the art KOSHER KITCHEN. The German Colony is surrounded by trees, gardens, and little parks. It boasts some of the most beautiful residences in Jerusalem, many dating back to the Ottoman period. This apartment is walking distance to many Hotels and Synagogues, and a 20 minute walk to The Old City/ Kotel. Great location & layout, clean & well maintained! Tzvi was a pleasure to deal with. He met us at the apartment and showed us everything we needed to know to make our stay comfortable. The apartment itself was in a great location very close to Emek Refaim in a really nice neighborhood. There are multiple quality restaurants, bakeries and grocery stores within close proximity. Our family of 6 were very comfortable and had all the amenities we needed, including a Kosher kitchen, satellite TV, Wi-Fi, living room with a comfortable large couch and a spacious eating area. Everything was well-maintained, clean, and the apartment was fully stocked. Definitely would recommend this property and would stay here again. Great find! Very comfortable for a family. We really enjoyed our stay in this apartment. It was very comfortable and provided everything we needed. There was plenty of room for our family (2 parents, one grandmother, 3 older teen/young adult kids). The location is excellent - just a couple blocks from all the stores, restaurants and buses on Emek Refaim and Rachel Imenu. The kitchen is kosher (the owners take this seriously) and well-stocked, and utensils were labeled clearly, which we appreciated. We would definitely stay there again if we have an opportunity. Thank you! The best vacation rental value in Jerusalem! The Shostak apartment at Rehov Rut 11 is the best vacation value in Jerusalem! It’s location is superb, on an attractive, tree-lined residential street that is a one or two minute walk from Emek Refaim, the main shopping street for restaurants and supermarkets. The apartment is large, clean, extremely well-kept, and is stocked with just about everything a vacationing family might want...right down to the numbers of three local taxis posted on the refrigerator. The owner is a pleasure to deal with, and his fee structure is most reasonable. My family and I spent two weeks in this lovely and well located Jerusalem apartment. It's the 3rd time we have stayed here in the past couple of years! The location is fantastic - heart of German Colony and walking distance from numerous restaurants and synagogues. The furnishings are comfortable, kitchen is kosher ( a big + for us), and the apt includes a washer/dryer and WiFi. We were able to host 15 guests for dinner in the spacious DR! Tzvi, the owner, is very responsive to any needs or questions. I would certainly stay there again! AMAZING! Not a detail was omitted. A perfect place to be home away from home! Perfect location, quiet street, comfortable, spacious, completely appointed kitchen, bath etc. and every amenity imaginable. Immaculate and everything up to date. The WELCOME booklet was invaluable. I can't say enough good things about 438301! Access to Emek Refaiim, as well as access to Tachana Rishona and a managable walk to the Old City if you're a walker. I would recommend this property 1000%!. True home away from home! We spent three weeks in this apartment and it felt like home. Apartment is very large and comfortable. Owners thought of every detail starting from very cozy couch in the living room, large table in the dining room, very comfortable beds and very well equipped kitchen. Perfect location, close to shops , playgrounds and places to eat out. We were able to walk to Kotel with our 4 little children. We will be back!